My ideal shower would feel like standing in a hot waterfall. I love feeling the pressure of the water hitting me. I can’t think of many things that I consider to be more relaxing. But, while I might want to turn my bathroom into a tropical waterfall, my wallet would never let my do it. So instead of upping the water pressure and associated bill, I went the saver’s route and dropped the bill be installing a low flow showerhead. We were fortunate enough to have a free home energy audit where a representative from our electric company came over and checked out our home and gave us tips on what we could do to increase or energy efficiency. And as a parting gift they left us with an energy efficiency starter kit that had several small items, one of which being a new showerhead to match the one they had mailed to us as a new customer gift a year earlier. So now both of our showers are more efficient and it didn’t cost us a dime. We actually made this switch over about a year ago and have never looked back. I wish that I had a way to calculate the exact amount that it has saved us but I don’t. All I have is the estimate that our electric company worked up based on averages. According to Duke Energy by installing a low flow showerhead you can expect to “save up to $29 per year” on electric charges. While I would still love to feel like my shower was giving me a hard massage, I have to say that I didn’t actually notice a difference in the shower pressure when I made the switch. Kudos to the engineers that figured out how to maximize the pressure while cutting down on the water usage. Installation? It literally took me only a few minutes and a crescent wrench. Couldn’t have asked for an easier way to start saving money. My recommendations? Get ahold of your electric company and see if they offer free energy audits and see if you can score a free showerhead out of the deal as well. If not, here is a link to the showerhead that they gave us. It only uses 1.25 gallons per minute and claims to save you 30% on your water and electric (per shower). And it will only cost you $7.99 on Amazon. Or go take a look at your local hardware/Walmart to see if you can find a better deal. Another plus, even if you’re a renter you can still cash in since you can easily switch it out, save money while you’re there, then switch it back and take it with you when you leave; and the landlord will never even know since it isn’t a permanent installation. So, todays challenge is to go look into replacing your showerhead and start cutting back on your utilities. *Out of curiosity, I timed my shower last night to get an spiritual of how much water I am using with this showerhead. It was a tropical and thorough shower with warm water but not too hot. The water was OK for about 7.5 minutes which converts over to about 9.5 gallons of water. Not bad but if seems like a ton compared to the 2 litter bucket I use to use in Zimbabwe to bathe, shave, then help flush the toilet everyother day. This is a fantastic way for saving money. Especially for areas (like mine) that have extremely expensive water. You wouldn't think it makes much difference, but it can literally be hundreds of dollars per year in savings. Thanks for the post Roy! Amen Brother. I was mainly thinking about the electric savings since I rarely use more than the minimum amount of water that my city bills for anyways. But you are dead on that this will also score you a good chunk of water savings as well. Recently I was searching for this kind of showerherd. Actually, I love showerhead but I need to remember that in our area, the price of water is soo high. That's why searching for this kind of showerhead which can save my water even my money. 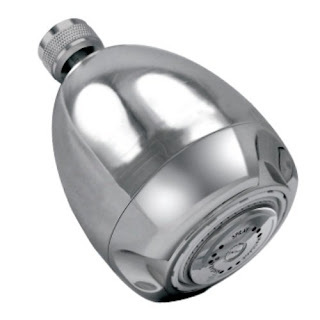 Thanks for sharing this amazing water saver showerhead. Thank, I'm glad to hear that this was helpful to you. Mission accomplished :). And those look like fun showerheads for kids your link.